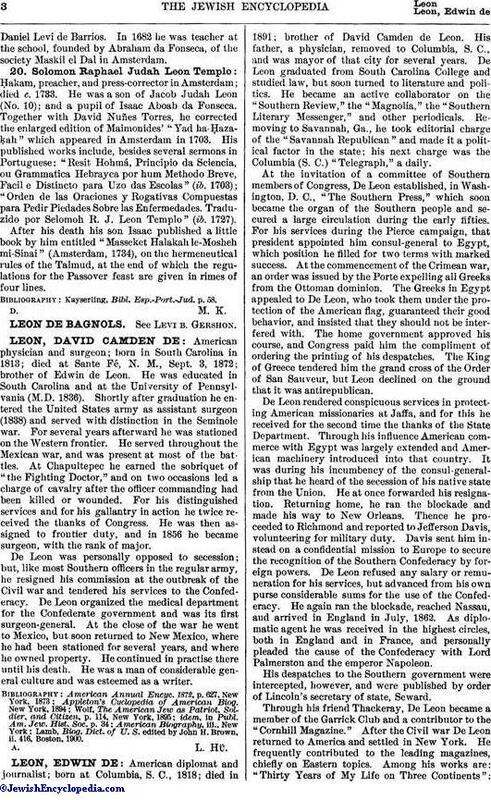 American physician and surgeon; born in South Carolina in 1813; died at Sante Fé, N. M., Sept. 3, 1872; brother of Edwin de Leon. He was educated in South Carolina and at the University of Pennsylvania (M.D. 1836). Shortly after graduation he entered the United States army as assistant surgeon (1838) and served with distinction in the Seminole war. For several years afterward he was stationed on the Western frontier. He served throughout the Mexican war, and was present at most of the battles. At Chapultepec he earned the sobriquet of "the Fighting Doctor," and on two occasions led a charge of cavalry after the officer commanding had been killed or wounded. For his distinguished services and for his gallantry in action he twice received the thanks of Congress. He was then assigned to frontier duty, and in 1856 he became surgeon, with the rank of major. De Leon was personally opposed to secession; but, like most Southern officers in the regular army, he resigned his commission at the outbreak of the Civil war and tendered his services to the Confederacy. De Leon organized the medical department for the Confederate government and was its first surgeon-general. At the close of the war he went to Mexico, but soon returned to New Mexico, where he had been stationed for several years, and where he owned property. He continued in practise there until his death. He was a man of considerable general culture and was esteemed as a writer. Lamb, Biog. Dict. of U.S. edited by John H. Brown, ii. 416, Boston, 1900.